My July article for La Voce is now available under the "Mamma Mia!" tab of their website (www.lasvegaslavoce.com) Also, double click on this picture to enlarge the text. 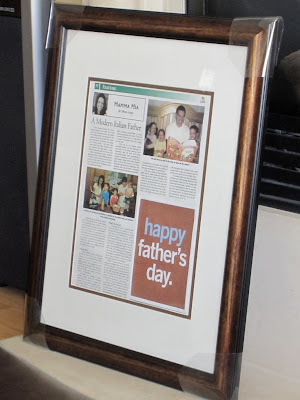 A tribute to my husband, I had the article framed and then kept the July issue of the paper away from him for as long as possible and gave it to him for Father's Day. It now hangs in his new office, at his new job, in a new state, because - you guessed it - we moved! About 8 weeks after our newest addition, I was busy packing and moving la tutta famiglia to Washington State! What a change from the desert (a welcome one). So thats my excuse for the lack of posts. But I still write for La Voce so please, continue checking for my articles there until I get back into the swing of posting here. Ciao, and Buon Natale! 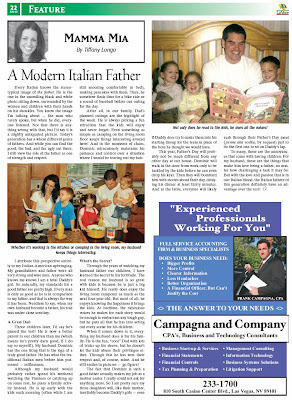 A great article, and as an Italian American father myself, very inspiring! Glad to hear from you again...was wondering where Una Mamma disappeared to! i know im horrible! but ill be back more often.....once im done shoveling my driveway! gotta get used to snow again!